Have you ever posted your recent GoDaddy Email Marketing newsletter to Facebook, only to discover that the final Facebook post is displaying the wrong campaign? Never fear, we've got your solution here! First of all, don't panic. You don't need to delete the Facebook post, at all. The steps below will fix this issue, without you needing to repost anything. This scenario can sometimes happen when you've cloned a campaign, in your GoDaddy Email Marketing account. Then you go about editing the new one to update it, and add new images, and change the text, etc. However, Facebook is still stuck on referencing the thumbnail and images from the original version. You simply need to refresh the Facebook reference to your GoDaddy Email Marketing permanent URL, and all will be well. This is actually the same URL that you pasted into your post on Facebook. And you need it, now, too. So, either copy it directly from your Facebook post... or click on the Share button, underneath the campaign thumbnail, on your GoDaddy Email Marketing Campaigns page. The GoDaddy URL is already highlighted, so just copy it and you're done. 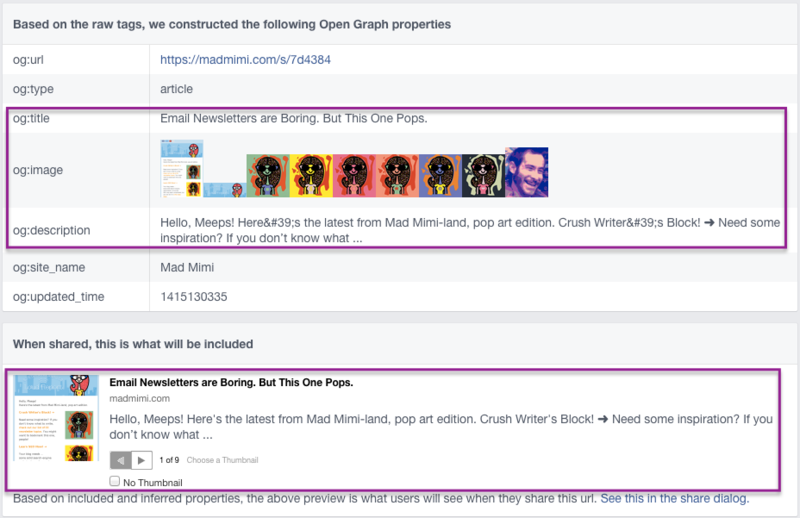 There is a page where you can debug your links, just for Facebook! There is a field where you can enter your URL, to have Facebook refresh all associations and external links. Paste your copied GoDaddy URL into that field and hit the blue Debug button. That will bring up all the information about that link, in Facebook. Now, click the blue button that says Fetch new scrape information. Once you hit the Fetch new scrape information button, you should see the whole display below (with a lot of technical seeming information), refresh. The most important part to pay attention to is the section that says "Based on the raw tag, we constructed the following Open Graph properties". And the one below that called "When shared, this is what will be included." In the first section, check that the "og:title", "og:image", and "og:description" are showing the correct text and images from the most recent version of that campaign. And then below that, in the share preview section, you can actually see a sample of what it will look like when you paste that same URL into a post on Facebook. This should match all the object properties items above, also displaying the most recent information for this specific campaign. If you've already deleted your Facebook post, no worries. You can simply paste this same GoDaddy URL into a new post, and the preview and display should be updated. But if you didn't delete your old post already, just refresh your Facebook page, and you should see that most updated, recent information. If you're still having trouble, just call our award-winning support team 24/7 at (480) 463-8836 -- we're here for you!